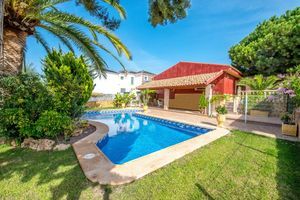 These wonderful villas are located, in the area of Torre del Moro Torrevieja. VILLA ONE LEVEL FLOOR¡¡ with a plot of 300 m2 approximately, with a constructed area of 158 m2 including basement. The houses have living room, kitchen, 3/4 bedrooms, 2/3 bathrooms, with solarium with spectacular views of the sea.EQUIPPED with Pool 7.00 × 3.50 m with salt water, pre-installation of ducted air conditioning, Aerotermia. * Comes with Open basement in the properties nº 5, nº6, nº7 and nº8The enclave is very close to all services, coastal area and beaches, with Alicante airport just 30 min, a privileged location from which to enjoy everything at your fingertips.The beach of La Mata, located in the hamlet of the same name, is the perfect beach for lovers of long and wide beaches in which to walk in a peaceful way. It has a multitude of complementary services that will make the whole family enjoy a perfect day of sun and beach. A good example of this are the 14 chiringuitos that it has, as well as 8 volleyball courts, 1 beach soccer field, pedal boats and a large number of accessible ramps, a beach for everyone. It has ISO 9001 and ISO 14001 certifications, and with the Qualitur and Blue Flag award.Distance to the sea 0.200 km, to the Golf 7 km and to the Airport 30 km.